In the months following my birth in 1978, Robert Edwards and Patrick Steptoe founded Bourn Hall in Cambridgeshire, UK as the world’s first IVF clinic, so that they could develop the technique that had proved successful with my birth. It is a wonderful Jacobean Mansion set in beautiful grounds and I have visited many times over the years with my family. We planted a tree there in memory of my mum Lesley when she died. It is a special place for me. That is why I am delighted to be involved in promoting the Bourn Hall clinics that are now bringing hope to people with fertility problems in Dubai and Al Ain in UAE. Things have moved on tremendously in the last 40 years but the desire for people all over the world to have a baby has not changed. The clinics are taking forward the work of Patrick Steptoe and Bob Edwards in the 21st Century using the latest techniques. Those two men were like grandfathers to me and along with my parents and their assistant Jean Purdy with the pioneers of IVF. Patrick Steptoe gave me the middle name Joy because he said my birth brought joy to so many people. Those who successfully find themselves with a baby in their arms as a result of the work of the clinics in Dubai and Al Ain will know that joy. I am looking forward to meeting the families being helped by the clinics; the wonderful staff going about their dedicated work there and seeing the investment in the latest equipment and techniques. Bourn Hall International (BHI) is was founded by Bourn Hall, UK together with healthcare dedicated private equity provider TVM Capital Healthcare in 2010. BHI operates world-class branded in vitro fertilization (IVF) reference centers in Dubai and Al Ain. Bourn Hall founders invented IVF in 1978 with the first successful birth of a child, Louise Brown, conceived through an IVF procedure, the “test tube baby”. Since then, ‘Bourn Hall’ has become synonymous with IVF and most of what is today the standard treatment protocol for IVF procedures has been pioneered and established by Bourn Hall. As the ultimate testament of Bourn Hall’s world-leading expertise, its founder, Professor Robert Edwards, was posthumously awarded the Nobel Prize in medicine in 2010 for the invention of IVF. Our clinic in Dubai is spread across 22,000 sq ft offering the best of clinical and operational services in the region. We offer: 7 private patient suites, 7 examination rooms and 2 operating theatres. 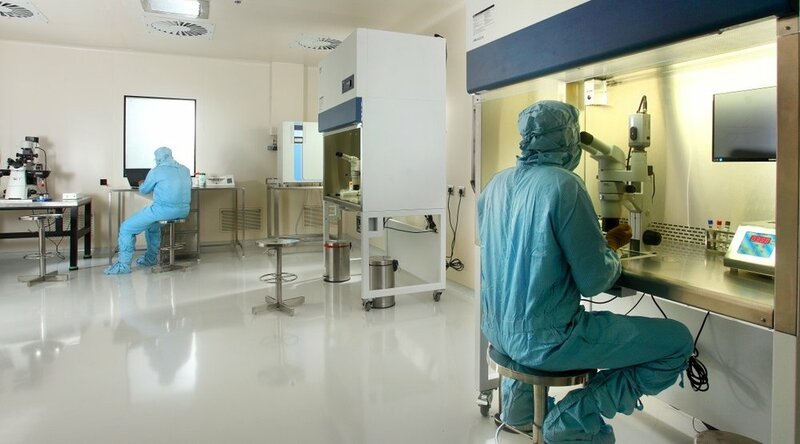 Our laboratory is the first and largest in the region to be a “Clean Room”. This allows for maximum embryo development. We also offer an observation area to look into our laboratory which is popular with patients. We have two state-of-the art and fully equipped Operating Theatres where we carry out IVF related Procedures and Andrology cases. The operating theatres are built to the highest international surgical standards with positive pressure air flow and filtration.